Top Contributors - Haegeman Nicolas, Rik Van der Hoeven and Amanda Ager - Van der Hoeven Rik, Henau Laurien, Derick Glenn, Kafkot Nick. Thoracic radiculopathy represents an uncommon spinal disorder that is frequently overlooked in the evaluation of spinal pain syndromes. Thoracic radiculopathy is typically caused by mechanical root compression. A radiculopathy is not the same as radicular pain or nerve root pain. The term radiculopathy refers to the whole complex of symptoms that can be caused by a nerve root pathology, such as: paresthesia, hypoesthesia, anesthesia, motor loss, pain and stiffness. Radicular pain indicates a single symptom: pain, which can originate from one or more spinal nerve roots. The most important structures which are involved with a thoracic radiculopathy are: the thoracic vertebrae (T1-T12), the intervertebral disc of the thoracic vertebrae, 12 pairs of spinal nerve roots, posterior rami (innervate the regional muscles of the back) and ventral rami (innervate the skin and muscles of the chest and abdominal area). The patients with thoracic radiculopathy often suffer from radicular symptoms such as pain and hyperalgesia, parasthesia, dysthesia and allodynia. Depending on which nerve root is affected, the loss of sensation will occur in a segmental pattern across the thorax. Sometimes the patient also will complain from lower limb pain, vague abdominal or chest pain and axial pain. Another symptom which is not always present is the loss of weight, the affected nerve root can affect the intestines. The diagnosis of thoracic radiculopathy can be based upon the characteristic history, physical examination findings, cutaneous sensory examination, paraspinal electromyography and CT-scan of the abdomen (to exclude malignancy). The electrodiagnostic evaluation of suspected thoracic radiculopathy should include needle EMG of thoracic paraspinal muscles. Associated intercostal and abdominal musculature may be additional muscles that can help in the diagnosis. The exclusion of other causes of pain is the most important step in the diagnostic procedure. Since there are a lot of generators of thoracic pain (see the list below), differentiating these differential diagnoses will be difficult. Another difficulty is the differential diagnosis of T1 radiculopathy due to the similarity of clinical findings to C8 radiculopathy. Several characteristics such as diminished sensation in the axilla, motor deficit involving only the intrinsic muscles of the hand, and Horner’s syndrome may distinguish T1 radiculopathy. A bilateral ganglion cyst may also cause thoracic radiculopathy, but this is very rarely seen. A study reported a 53 years old woman who presented with bilateral groin pain and severe numbness. Magnetic resonance imaging revealed bilateral cystic mass in the intervertebral foramen between 12th thoracal and 1st lumbar vertebrae. The cystic lesions were removed after bilateral exposure of Th12-L1 foramens. A case study found thoracic ossification of the ligamentum flavum, which has been widely recognized as a main cause of thoracic myelopathy, was the cause of thoracic radiculopathy. A 67-year-old man complaint of back pain radiating to the right abdomen. Neurological examination revealed mild sensory deficit at the right side of the abdomen at the T9–10 level. Magnetic resonance imaging and computed tomography demonstrated ossification of the ligamentum flavum at the right T9–10 level. Conservative treatment was not effective to this patient, but a surgical intervention was effective and the pain disappeared immediately. However this has not been seen frequently, it should be considered as a differential diagnosis. Because of the broad spectrum of differential diagnosis it is hard to discover the cause of thoracic syndromes, differentiation between the other causes and thoracic radiculopathy is important. - Electrodiagnosic evaluation: Needle EMG of thoracic paraspinal, abdominal and intercostal muscles can be preformed to help the diagnosis. Fibrillations and positive sharp waves in the paraspinal muscle can provide information about the level at which a problem is located. It is also used to differentiate between diabetic thoracic radiculopathy and other intraabdominal and intrathoracic diseases. This technique is not used often nor is there any evidence that the intercostal muscles add to the diagnosis. - Imaging: Plain radiographs, MRI, myelography and CT are often used to determine the cause and/or exclude other diagnoses. - Diagnostic selective nerve root block: injections preformed to confirm or exclude a clinically suspected pain generator. The sensitivity (87%-100%) and specificity (94%-100%) is strongly dependent on the correctness of the preformed technique. To evaluate the patients outcome after surgical or non-surgical treatment the pain and disability was mostly examinated. This was also used in the study of Scott M.W. Haufe et al (VAS and Oswestry Disability Index). The first examination is looking for symptoms (already discussed earlier). Due to non-universal tenderness and the sensory changes, it is not reliable to do a sensory examination. Physical examination is not the best way to evaluate thoracic radiculopathy, unlike the lumbosacral and cervical radiculopathies the affected muscles cannot be tested isolated. Therefore the examination will rather be used to exclude other diagnoses then to determine a thoracic radiculopathy. Thus the examination will be done with more medical strategies and therefore we can use: EMG, MRI, CT, radiographs,... But those are already discussed in: “Diagnostic Procedures”. Conservative treatment (anti-infl. Med., muscle relaxants, physical applications, exercise) is generally recommended for patients with a thoracic radiculopathy and is effective for one-third of the patients. Acute symptoms can be treated similar to those of a cervical and lumbar radiculopathy. When there are symptoms of progressive myelopathy, neuromuscular comprimise or when incapacitating symptoms continue to exist other treatment is advised. structural disease despite conservative treatments for 2 months, and/or progressive myelopathy as the result of structural disease, may be candidates for surgical intervention. for the success of all thoracic spinal surgical procedures. - Epidural steroid injections (no study reporting outcome or efficacy available for thoracic radiculopathy on PubMed),nerve root blocks (90% significant pain relief, only suitable for patients with symptoms at one or two segments), percutaneous disc decompression (used for radiculopathy due to disc herniation), percutaneous vertebroplasty (used to treat compression fractures, although they are usually treated by non interventional techniques). - Surgical treatment : Laminectomy for disc herniation has been disfavored because of a 28% chance to make it worse, myelopathic symptoms disappeared in 95% of patients who underwent surgical management for thoracic disc disease. We should conclude that for surgical procedures proper patient selection and identification of symptomatic structural pathology is needed. We should avoid open surgery because of the high chance of complications and only use it when conservative and less invasive procedures fail. Endoscopic thoracic laminoforaminoplasty has also been used for the treatment of thoracic radiculopathy. The study has used 12 patients and with this surgical treatment seven patients showed marked improvement in pain scores. Visual Analog Scale and Oswestry Disability Index has been used and there was a significant difference between pre and post surgical data. Their conclusion was that endoscopic laminoforaminoplasty offers an alternative to fusion or conventional laminotomy with similar success rates. Patients additionally benefit from a decrease risk of complications, short hospital stay, and faster recovery. 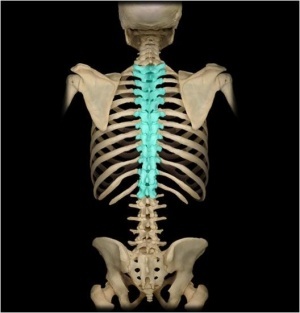 Generally acute symptoms (no sympthoms of progressive myelopathy or neuromuscular compromise) are treated the same way as a cervical or lumbar radiculopathy, the conservative treatment of thoracic radiculopathy includes: short-term bed rest, NSAID, muscle relaxants and physical therapy. Physical modalities of the therapy include: ice, heat, ultrasound and TENS. These forms of therapy give a short-term symptomatic relief but will have no effect on the long-term development. Managing the subacute and chronic symptoms of thoracic radiculopathy consists of spinal extension exercises. Unfortunately there are none or few clinical studies about the effectiveness of conservative treatment interventions for thoracic radiculopathy. The mainstay of treatment of diabetic thoracic polyradiculopathy is symptomatic therapy and includes: antidepressant drugs and transcutaneous nerve stimulation. A systematic review wanted to see the effect of spinal manipulations or mobilisations in the management of cervical, thoracic, and lumbar-related extremity pain. At present, no evidence exists for thoracic radiculopathy. Conclusion: there is not much evidence on this subject, more studies are needed to know what is the most effective therapy for thoracic radiculopathy. For a short-term relief of complaints you can use: ice, heat, ultrasound and TENS. But unfortunately there exists no evidence for long-term relief of the patient his complaints.